Disclaimer: This post probably will contain spoilers for all of the Danganronpa properties so be warned about that right now before you continue reading. For anyone here who wants to catch up on all the series, there is a wonderful YouTuber by the name of Oni Black Mage that does “Recapitations” of Danganronpa 1, Danganronpa 2, Ultimate Despair Girls as well as a few other convoluted ones (I’m looking at you Kingdom Hearts franchise XD) that can catch you up on the story. For the purpose of this article I’m not going to recap the whole series because I’m too emotionally distraught. I have been playing the Daganronpa games since they were first released in the West. It was a title that, at the time, was niche enough that they were expecting a western release and quirky enough that it fit into my category of obscure game that I must own. So play I did, both the Phoenix Wright styled visual novels and I attempted to play Ultra Despair Girls even though I’m horrible at shooters. The story was unfolding over all three games so imagine my surprise when they announced that the finale was going to be done over two animes instead of games. I was immediately saddened and disappointed by how they would inevitably shorten the storytelling and not allow for too much character development because anime series can only be but so long. They decided to have both arcs follow different paths—Side: Despair Arc would tell the story how how “despair” spread to the masses and the rise of Junko Enoshima while the Side:Future Arc would tell the conclusion of Makoto Naegi’s adventures. Needless to say, I thought the Future Arc would cause me way more distress than the Despair Arc but I was oh so wrong. There were things that I didn’t take into account like how knowing the Despair Arc’s ending would take a very emotional toll on me as I watched the series. The Despair Arc starts very cheerful down to the opening credits. 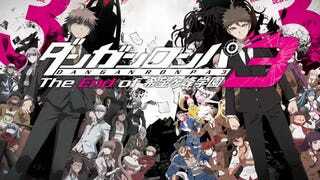 The song is upbeat and full of life and the characters, who are the main cast of Danganronpa 2, were happy as well. I’m not used to ANY Danganronpa universe having too many happy moments while the player is waiting for the other proverbial shoe to drop. The cast of this arc had all the makings of the original cast in DR1, to bond together for a better tomorrow since that’s why they were at Hope’s Peak to begin with but then enters Junko. Her method of bringing about mass despair was brainwashing. A lot of people have commented that using brainwashing as the catalyst for the destruction of the world was cheap and I must admit it struck me as the same now that I knew these characters origins. However, it didn’t stop the end result of worldwide despair from happening. And in another interesting emotional twist, some of the characters in the Future Arc, who I had never seen before, were also present in this arc which in turn fleshed out the characters and made me care about them more. Who would have thought? One character that I knew I wasn’t going to care about was the overly cheerful teacher Yukizome. I knew she was going to die at some point because that’s how this game works, but I almost wish that would have happened to her cleanly. Unfortunately though, Yukizome’s transformation was probably the most tragic of them all. (They haven’t aired the next Despair Arc episode as of this writing so don’t quote me just yet). Junko, as she was perfecting her brainwashing, used Yukizome in her trials and she ended up becoming a Despair. I had to wrack my brain and consult a video for DR2. I didn’t recall seeing her in the game at all. She is in the Future Arc so she had to have gone somewhere right? The reddit thread I visited suspects that she may have been the Monokuma Maid from Danganronpa Zero but I haven’t read it personally to confirm. Either way, after her run in with Junko she was no longer the character we all had grown to know. As of the Episode 10 Future airing, the reddit theory had been confirmed—Yukizome had indeed become a Despair and was either hiding it when she was with Munakata or he treated her after Hope’s Peak collapsed hoping to repress her despair side. Whatever intervention they were using was not a success because Yukizome had developed a split personality. She was still going around acting “normal” only to then kill people later when it pleased her. There are some other bad things that happen in the shows like some of my favorite characters dying, unforeseen plot twists, tragic backstories, etc. It’s all here in boat loads. If there is one thing I’m still in the dark over its about Hajime Hinata and his role as Izuru Kamakura. He’s tall, dark, broody with creepy red eyes who was the last experiment in creating artificial ultimates. Its evident that Izuru, with all of his ultimate infusions, does things when it pleases him as he is very stoic and disinterested when he is not seen as Hajime. We still have about 2 episodes left for each side so that’s 4 episodes to try to get the whole truth and a resolution and I’m not sure that we actually will. I’m writing all of this to say that this show is like watching a train wreck. It’s horrible but you can’t turn away. Each game when I played it was like this. I can even feel my body physically reacting when I hear the Daganronpa music or see the damn bear XD. I’m pretty sure I’m experiencing these emotions because I believe that humans have to be better than what’s illustrated in this story. I actually get a Psycho Pass vibe concerning the motives behind the antagonist’s actions. But it is a great story especially if you’re into murder mysteries and comic book styles. Definitely check it out then follow it up with Sweetness and Lightning or some other slice of life show. Or a drink, whichever one works.